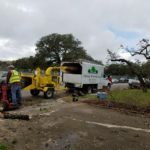 Canopy Tree Service Cleans up damaged trees from tornado that touched down President’s Day 2017. On Monday morning, February 20, 2017, President’s Day, several small tornadoes hit San Antonio, TX. Storm damage was everywhere. One hit in the 78209 area, not far from the San Antonio airport. Crews from Canopy Tree Service were summoned to the Rockhill Drive area where we have some repeat customers to work with who definitely needed emergency tree trimming. As our crews pulled up, we saw trees down for several blocks around in all directions. Up and down the street neighbors stood outside looking around in awe at the damage the storm did to the trees and roofs. The nearby elementary was closed as storm damage was assessed. Our first customer had some heavy storm damage in the front and back. The trees in the front had several large branches broke off and more hanging in a Live Oak in the front yard over the doorway and driveway. the storm damage in the front was particularly dangerous. Several large limbs had to be lowered down using ropes and skilled tree climbers. All of my climbers have been doing tree service for all of their lives so hazardous storm damage is no problem. The backyard had a large tree down but it didn’t hit anything except the fence. Fortunately, we had recently removed a large Cedar Elm limb from over the roof. That branch could have been particularly susceptible to storm damage with the size and weight of the branch we had previously removed it could have done some heavy damage to the roof. Another asset for storm damage work is the dingo, a “miniature skids steer” which can get into some tight spaces and haul a large log out up to 500 lbs, no problem, no chiropractor. Any time you’re working on storm damage you have lots of large logs and tons of brush. an extra strong back is great. Our specialized equipment came in handy on this day. Usually with storm damage, due to the emergency nature commanding longer hours and harder nature of the work, there are higher prices, but today, with repeat customers, we charged our regular rates. We were able to accommodate their neighbors at a regular job rates as well. If all goes well, the cleanup will be complete within a week or two and we hope our rapid, skilled work at reasonable prices will create some loyal, future customers.